TASER devices can disable an attacker from up to 15 feet away. They are the best non-lethal device available. 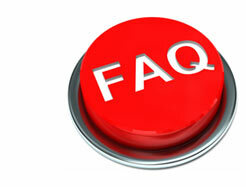 Here you'll find questions frequently asked by those interested in purchasing a TASER device for protection. CAN REGULAR CITIZENS PURCHASE A TASER DEVICE ONLINE? Yes. TASER devices are not considered as firearms by the United States Bureau of Alcohol, Tobacco, Firearms and Explosives (ATF), therefore, no prequalification process is required. Orders must be delivered to one of the 48 states in which TASER devices are legal. Tasers are restricted from citizen use in New York, New Jersey, Massachusetts, Rhode Island and Hawaii. 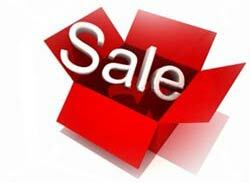 Orders placed online before 2PM central time ship the day they are placed. 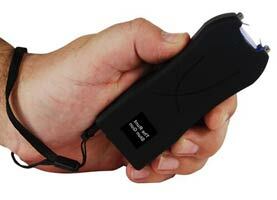 We will not ship TASER devices outside the United States. 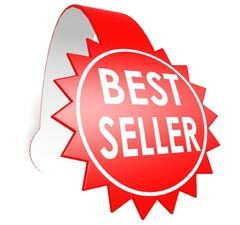 Background checks are no longer required to purchase a TASER, however, if you have committed a felony, you should consult with your parole officer or local law enforcement agency before purchasing a TASER, or any of the other weapons sold on this website. Most states require the presence of an adult for users that are under the age of 18. 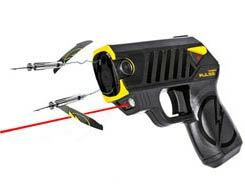 ARE THERE ANY SPECIAL REQUIREMENTS NEEDED TO BUY A TASER DEVICE? Most states require the presence of an adult for users that are under the age of 18. 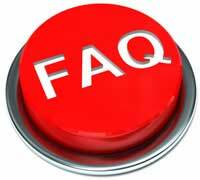 Background checks are no longer required to purchase a TASER, however, if you have committed a felony, you should consult with your parole officer or local law enforcement agency before purchasing a TASER, or any of the other weapons sold on this website. Please note that all states require the carrier of any weapon to also carry a driver license, or other valid form of ID. 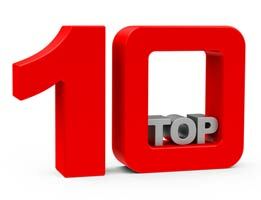 Even though TASER devices are not considered as firearms by the United States Bureau of Alcohol, Tobacco, Firearms and Explosives (ATF), Illinois, Wisconsin and Michigan require possession of a hand gun license to carry a TASER device. AFTER RECEIPT, DO I NEED TO REGISTER MY TASER WITH THE MANUFACTURER OR ANY GOVERNMENT AGENCY? WHICH TASER DEVICE SHOULD I BUY? 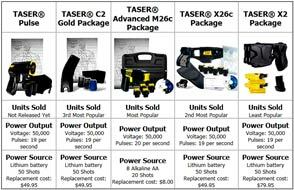 We sell all five TASER models to both professionals and regular citizens on a regular basis. Most professionals prefer the TASER Advanced M26c, TASER X26c or TASER X2, simply because they are more powerful than the other two. 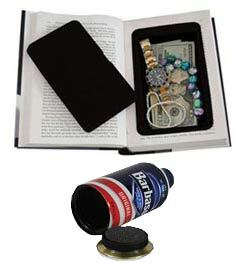 The model they select is simply influenced by appearance preference and budget. Click here to view all models. WHICH TASER DEVICE IS THE MOST POWERFUL? The TASER Advanced M26c, TASER X26c and TASER X2 Defender are the most powerful units, discharging 50,000 volts at 26 watts. 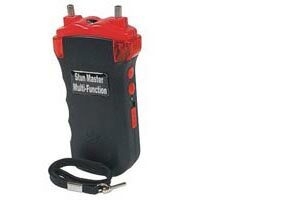 The TASER Pulse and TASER Bolt discharge 50,000 volts at 7 watts. Please note that even though the TASER Pulse and TASER Bolt emit less wattage than the other models, they discharge a 30 second shock, verses the other models' 5 and 10 second shock, therefore, the manufacturer states that they have the same disabling capabilities as the other models. 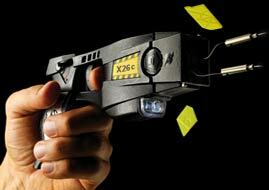 CAN TASER DEVICES REALLY INCAPACITATE AN ASSAILANT? Yes. 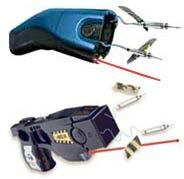 TASER devices utilize "electro-muscular disruption (EMD)" technology. 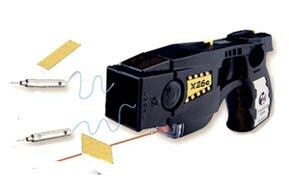 TASER devices use a powerful 50,000 volt electrical signal to completely override the central nervous system and directly control all muscles. This EMD effect causes an uncontrollable contraction of the muscle tissue, allowing the TASER device to physically debilitate a target regardless of pain tolerance or mental focus. 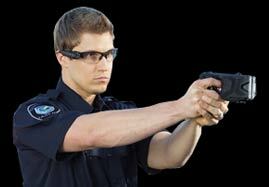 TASER devices are specifically designed to stop even the most elite, aggressive, and focused combatants. Rather than simply interfering with communication between the brain and muscles, TASER EMD systems directly tell the muscles what to do, resulting in muscle spasms, until the target is in the fetal position on the ground. The TASER device provides for maximum safety for both the user and the assailant by bringing dangerous situations quickly under control before force escalates to lethal levels. There have been hundreds of reports that TASER devices disabled attackers and probably saved the owner's life. 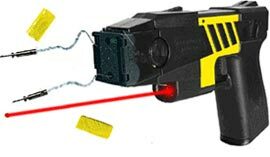 HOW DOES A TASER DEVICE WORK? Upon firing, compressed nitrogen projects two probes 15 feet at a speed of 180 feet per second. An electrical signal transmits through the region where the probes make contact with the body or clothing. 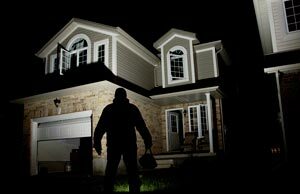 The result is an instant loss of the attacker’s neuromuscular control and any ability to perform coordinated actions. It uses an automatic timing mechanism to apply the electric charge. This cycle ensures that the nervous system of the target does not recover instantly to allow him to remove the probes. 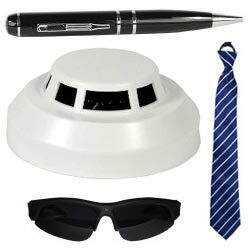 If you are a law enforcement official, this gives you a chance to place the target under custody. If you are a citizen, simply pull the gun back, run, then call the police. It is highly unlikely the assailant will be able to walk, much less run after you. HOW CAN THE TASER DEVICE BE SO EFFECTIVE YET NON-INJURIOUS? The TASER device does not depend upon impact, pain or body penetration to achieve its effect. Its pulsating electrical output interferes with communication between the brain and the muscular system, resulting in loss of control. However, the TASER device is non-destructive to nerves, muscles and other body elements. It simply affects them in their natural mode. 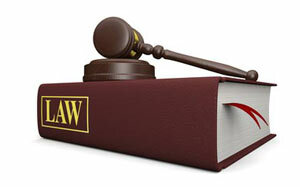 More importantly, no court of law has ever ruled that a death has ever been directly attributed to the TASER device. WHAT HAS TESTING REVEALED REGARDING THE TASER DEVICE? Anesthesiologist and specialist in medical electronics, Dr. Frank Summers, MD of St. Joseph’s Hospital, Orange, California, directed tests of volunteers at St. Joseph’s in 1971 and 1974, after the invention of the first TASER device. Dr. Summers stated, "We conducted this [volunteer test] in the operating rooms at St. Joseph’s Hospital. We had an assembly of cardiovascular surgeons, cardiologists. We had a real [TASER]. We tested extensively and made movies. The tests were impressive. We monitored all parameters of physiology, including electrocardiographs. The tests did not produce any lethal effects and we found that the background work that had been done did indeed pan out in practice." DOES THE TASER DEVICE AFFECT THE HEART OR A CARDIAC PACEMAKER? The TASER’s output is well below the level established as "safe" by the federal government in approving such devices as the electrified cattle fence. In a medical study of electronic stun guns, Dr. Robert Stratbucker of the University of Nebraska Medical Center confirmed that the T-Wave does not interrupt the heartbeat or damage a pacemaker. Any modern pacemaker is designed to withstand electrical defibrillator pulses that are hundreds of times stronger than the TASER device's output. The TASER device current of 0.3 joules is well below the 10-50 joule threshold above which cardiac ventricular fibrillation can occur. High voltage, in itself, is not dangerous. 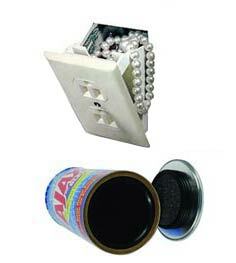 One can receive a 25,000-volt shock of static electricity from a doorknob on a dry day without harm. The physiological effect of electrical shock is determined by the current, its duration, and the power source that produces the shock. The typical household current of 110 volts is dangerous because it can pump many amperes of current throughout the body indefinitely. By contrast, the TASER device's power supply consists of batteries that are capable of supplying electrical power for a few minutes, but will not kill the assailant (see "HOW CAN THE TASER DEVICE BE SO EFFECTIVE YET NON-INJURIOUS?" above). WILL THE TASER DEVICE CAUSE ELECTROCUTION? No. The output is metered by the electronics and the electrical energy in each pulse is always the same, regardless of the target condition. The electrical output will not be transferred from one person to another even if they touch. TASER, Inc.’s president has been stunned by a TASER while standing in water to emphasize this point. A person hit with a TASER device will feel dazed for several minutes. The pulsating electrical output causes involuntary muscle contractions and a resulting sense of vertigo. It can momentarily stun or render an attacker unconscious, yet the TASER’s low electrical amperage and short duration of pulsating current, ensures a non-lethal charge. Moreover, it does not cause permanent damage or long-term aftereffects to muscles, nerves or other body functions. A January 1987 Annals of Emergency Medicine study reported TASER technology leaves no long term injuries compared with 50% long term injuries for gunshot injuries. MUST THE PROBES PENETRATE THE BODY TO BE EFFECTIVE? No. The electrical current will "jump" up to two inches as long as both probes are attached to clothing or skin. At most, only the 3/8-inch needlepoint/hook will penetrate the skin. They have less energy than a spring propelled BB. WHAT IF THE PROBES MISS? 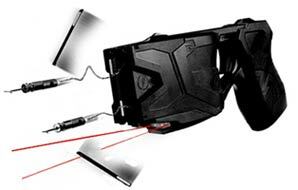 The TASER device can be used in a touch-stun mode. The user is thus provided with a final backup if the probes miss the target. Should the user miss or engage a second attacker, he can touch the unit directly to the target and it will work like a powerful touch-stun device. WHAT IS THE BEST-SHOT AT MAXIMUM RANGE? 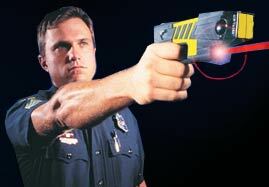 Even though TASER devices will disable an assailant fired at any range up to 15 feed, they are most effective if the spread of the probes are at least 6 inches. To ensure that the spread is six inches or more, the TASER device should be fired at a target from three to five feet away. DOES TEMPERATURE HAVE A DETRIMENTAL EFFECT ON THE TASER DEVICE? No. 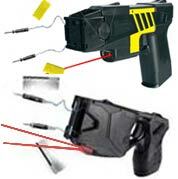 The TASER device utilizes compressed nitrogen (an inert gas). 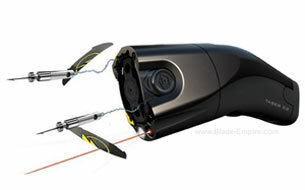 The TASER device compressed air capsules have successfully held their charges at temperatures of minus 20º F and up to 160º F. Moreover, altitude will not adversely affect the firing of a TASER device. In addition, the temperature will not affect the T-Wave. However, as with any product containing polycarbonates and other thermoplastics, the TASER device and Cartridges should never be left in direct sunlight. CLICK HERE for more information on all four models.